The Handicap Principle in social posturing. There is nothing like earning a spot on the endangered species list to elevate a trash fish to haute cuisine. 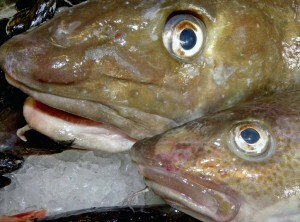 For centuries, the codfish was the protein of peasants: the salted baccalà of the Mediterranean and its immigrants, the pennies per pound, frozen bricks of cod fillets, broiled while still rectangular, topped with a touch of paprika and oleomargarine, and the greasy dough-encrusted, newspaper wrapped fish and chips of impoverished Scotland before Sean Connery discovered oil in the North Sea. Even in Cape Cod restaurants, it was disguised as the more palatable sounding “scrod”. But as soon as the North Atlantic cod had restrictions placed on the catch, it began popping up on menus all over finer restaurants. The cachet of an endangered species is just too much to resist, and when the WWF listed cod as officially “endangered” the price soared and it earned a premium spot on the chopped ice at Whole Foods Market. The posturing involved in ordering “the Cod” is well established as a bowerbird-like display of success, sexual prowess, and evolutionary adaptation. The behavior is known in evolutionary biology as “The Handicap Principle”. Simply stated, “showing off” signals that you have extra resources: energy, food, money. So you must be cool. Signaling prowess to community members through ridiculous expenditures, presumably, attracts potential mates to want to reproduce using your genes. Signaling fitness to predators or competitors, makes them want to give up competing with you in futility before even trying. 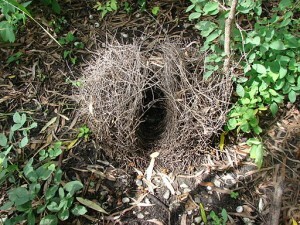 The most frequently used example in nature is the absurdly disadvantageous plumage of a peacock’s tail, or the elaborate mating bower built by a bowerbird. They both just cry out to females, “Dig me! Our children will be awesome.” Some gazelles, when threatened by a predator, instead of running away, will jump straight up and down to signal that they are so nimble, they aren’t worth chasing. A secondary benefit is that the stotting, as the jumping is called, also alerts other gazelles to the danger, thus ensuring herd survival and plenty of opportunities to reproduce later on. I wonder if the highest jumpers get the neatest girl gazelles? What do you think? Please answer below based on what you observe, not necessarily on your own behavior. Are menu choices in restaurants social posturing, or just what tastes good? Eating out is a social act and there is posturing inherent in every aspect of the experience, including ordering. It depends on the price, the more expensive, the more posturing. As with most things, it's a little of both. Most people order food they think tastes good. It’s a Friday night and Mrs. Paul is flipping around in her grave. Thank you for making me smile about the cachet-of-the-day. Thank you for your … observations, on the unusual in our everyday!